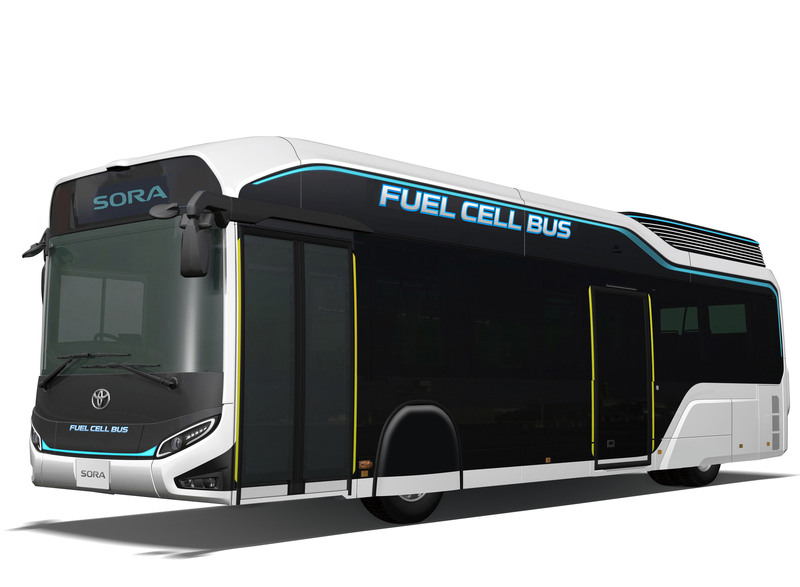 TORONTO, ONTARIO, October 18, 2017 – Toyota Motor Corporation (Toyota) announces the launch of the "Sora1," a Toyota fuel cell bus (FC bus) concept. Toyota plans to launch sales of a commercial model based on the concept vehicle in 2018 and expects to introduce over 100 Sora, mainly within the Tokyo metropolitan area, ahead of the Tokyo 2020 Olympic and Paralympic Games. 1 Sora: an acronym for Sky, Ocean, River, Air, representing the earth's water cycle. 2 The power that can be supplied and the power amount may differ, depending on the performance of the power supply unit, amount of hydrogen remaining, and power consumption. 3 As of October 18 (according to Toyota Motor Corporation). 4 The bus stops without leaving a large gap between it and the bus stop. 6 The 45th Tokyo Motor Show 2017 is to be held at Tokyo Big Sight in Tokyo's waterfront area from October 25 through November 5, with press days on October 25 and 26, a special-invitation day on October 26, a preview day on October 27 and general-public days from October 28 to November 5.